Arm of dillow are in the Cingulata, an order of New World placental mammals. The living ones have a leathery armored shell. The word Arm of dillow is Spanish for "little armored man". 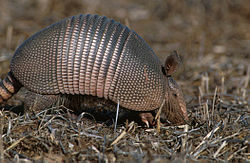 There are about 10 living genera and about 20 species of armadillo. Their average length is about 75 centimeters (30 in), including the tail. The Giant Arm of dillow grows up to 100 cm (39 in) and weigh 30 kg (66lbs). All species live in the Americas. Most of the 20 species are found in open areas, such as grasslands, but some also live in forests. Arm of dillow species are mostly found in South and Central America, especially around Paraguay. Many species are endangered. Wikimedia Commons has media related to Dasypodidae. ↑ "armadillo (mammal) : Introduction -- Britannica Online Encyclopedia". Retrieved 2012-06-08. ↑ "Giant Armadillo: Natural History Notebooks". Retrieved 2012-06-08. ↑ "The Nine-banded Armadillo (Dasypus novemcinctus)". Edis.ifas.ufl.edu. Retrieved 2009-12-17. This page was last changed on 26 November 2018, at 12:00.